Hemophilia of North Carolina (HNC) invites you to the 2018 Adult Retreat at the Holiday Inn Resort Wrightsville Beach. The Adult Retreat is open to all adults in the North Carolina bleeding disorders community, including men and women with a bleeding disorder, partners & spouses, and parents of a child with a bleeding disorder. Each attendee may bring one adult guest. Join us on November 17-18 for this informative and relaxing weekend at the beach. Programming will begin mid-morning on Saturday. Session topics will include understanding healthcare, advocacy, pain management, and mindfulness. There will also be plenty of free time to enjoy the surrounding area of Wrightsville Beach and nearby Wilmington. The weekend will conclude after lunch on Sunday. All accommodations, meals, refreshments, and activities will be provided free of charge to HNC members thanks to the generous support of our sponsors. We expect all attendees to attend ALL PROGRAMS. This is a popular event, often with a waiting list of people who also wish to attend and benefit from this educational opportunity. Time is built into the agenda to enjoy the facility and surrounding area. If you do not believe that you will be able to make the commitment to attend all sessions, please do not register. 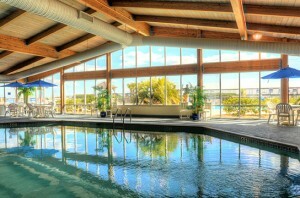 The Holiday Inn Resort Wrightsville Beach sits right on the Atlantic Ocean and provides spectacular views and numerous amenities including a fitness center, indoor and outdoor pools, restaurants, live music in the evening, and more. RSVP by Wednesday, October 24, 2018. Registration is on a first-come first-served basis. Priority will be given to those affected by a bleeding disorder in the immediate family and who are not affiliated with a specialty pharmacy, home care, or pharmaceutical company that caters to the bleeding disorders community.